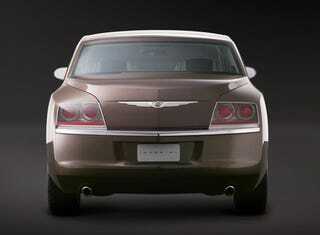 We noted earlier that Chrysler has killed the Imperial. You know, generally, we're for V8, rear drive cars. Success, after all, begets success, so we were thrilled to see the 300, Magnum, Charger and revised Mustang lead to the Challenger, the Interceptor, Camaro and G8, but after the inital "What is that?" shock wore off, the car seemed a half-baked Hail Mary, and given the troubles that have come to light in the year and a half since the concept's debut in Detroit, that impression's gained a lot more in the way of context. According to Chrysler mouthpiece David Elshoff, bringing such a machine to market in today's climate would be "irresponsible." Instead, the Imp's place on the Brampton production line will be taken up by the next-generation 300. Please boys, don't crackrock it up with Sebringesque styling cues. Killing the Imperial means that there might still be some signs of life in Auburn Hills. Let's hope so.